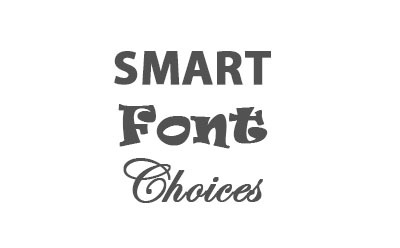 Home » MG Blog » ARE FONT CHOICES IMPORTANT? Think fonts are just aesthetic? Think again. Whether used in print, email, or online, fonts can be a critical part of your communications strategy. Here are three benefits of fonts you might not have considered. 1. Reinforce branding. Just as the color becomes associated with specific brands (think Tide Orange and Coke Red), the same can be said of fonts. Just look at The New York Times. You can pick out the Times on the newsstand from two blocks away. While some companies design their fonts as part of their branding strategies, you do not have to go to this extent. Select fonts you feel represent your brand and use them consistently across all of your marketing materials, whether print or digital. Over time, consumers will associate these fonts with your brand. This will increase the speed of brand recognition and give your marketing materials more credibility. 2. Communicate mood. If you want to communicate mood, selection of the right images, graphics, and color choices is critical. However, fonts can go a long way, too. Want to create a piece that is lighthearted and playful? Try Architect’s Daughter or Chalkboard. Want a romantic feel? Try a cursive script or handwriting font. Fonts can help elicit a variety of emotions, so experiment! 3. Communicate credibility. Fonts can tap into positive associations to project a sense of trustworthiness and credibility. Helvetica, for example, is used on government documents, and Courier is used on vintage books. Using these classic fonts can communicate authenticity. Even if you are using less traditional fonts, once people begin to associate your documents with certain fonts, this visual consistency will authenticate your materials and provide credibility, as well. While fonts can reinforce branding, establish mood, and provide a sense of authenticity, ultimately, they are intended to be read. So keep readability in mind, as well. For projects that have large blocks of text, keep it simple. Use fonts that are easy to read. Don’t use more than three fonts on the same page or project. Sans serif fonts, especially on the web, provide maximum readability. Want to learn more about fonts? Let our designers guide you!